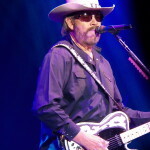 Hank Williams Jr. brought his rocking, outlaw country show to the James Brown Arena on Friday night in Augusta, GA. “Bocephus” would keep the crowd on their feet the entire show. As the arena was filling up, there was a skirmish that broke out in the floor section that grasped everyone’s attention. The guilty party was later escorted out of the arena by security to a thunderous applause. I guess you could say that the rowdy friends were already over. “Keep The Change” was a political song about the current condition of the United States. The song also touched on his controversy with Fox News from 2011. Williams cranked out the classic “All My Rowdy Friends Are Coming Over Tonight.” It was recently announced that Williams would be coming back to intro Monday Night Football on ESPN. 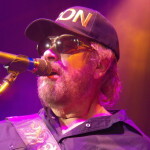 MNF just hasn’t been the same without the timeless tradition of Hank Jr. opening the show. 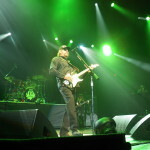 Williams added the upbeat “I Really Like Girls” in to finish the extended song. 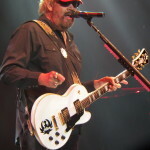 Hank Jr. paid homage to Southern rock artists by playing Lynyrd Skynyrd’s “On The Hunt” and “Gimmie Three Steps.” He also took a trip down to Texas with ZZ Top’s “Waiting On The Bus.” Hank Sr.’s “Kaw-Liga” followed and also had a rocking riff to it. Williams played the fiddle to close out the song. Williams went over to the piano on the right side of the stage and told stories about his unique upbringing. He spoke about how Elvis Presley, Fats Domino, Jerry Lee Lewis and Ray Charles would all stop by his home for a chance to touch his father’s piano. Williams then proceeded to play Jerry Lee Lewis’ “Whole Lotta Shakin’ Goin’ On” on the piano to perfection. 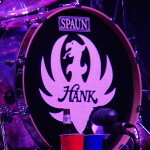 Hank Jr. told an extended story about how selective he is when deciding on concert dates. “If they ain’t figured it out by now, I’m gonna play where I want to, when I want to and for who I want to.” He then launched into “A Country Boy Can Survive” to end the solo acoustic set. Once they started the classic “Family Tradition,” the whole arena sang the opening lyrics. Williams eventually jumped in to finish the tune. 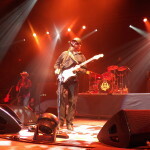 Williams thanked the crowd and then walked off the stage as his band played him out since there was no encore. 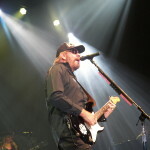 Augusta has become a hotbed with classic country musicians making stops year-round. Add Hank Williams Jr. to that list. 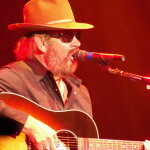 Hank Jr. performed his own classics, some of his father’s music and some covers. 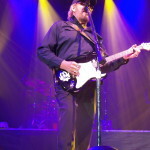 After the show, all of Hank Williams Jr.’s friends were leaving the arena very satisfied.